An abbreviated version of my story was published in the November 2014 Airways Magazine. Herewith is the full text, photographs and charts. Click on individual images for a larger view. Nearly 18 months after TWA ordered Boeing 747s, a joint announcement was made, on March 29, 1968, between Eastern Airlines, Air Holdings, Ltd. and TWA for 144 Lockheed L-1011s. The Trans World portion was for 44 airplanes (33 firm orders and 11 options), with 22 deliveries scheduled for 1972 and the balance spread over the following two years. This multi-company contract officially launched the Lockheed widebody tri-jet, considered to be the most advanced commercial airplane of its era. 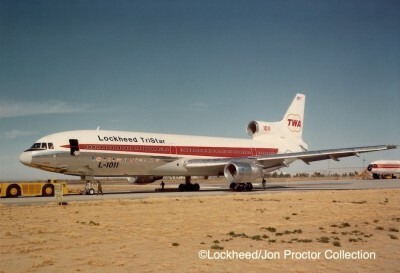 In the tradition of assigning stellar designations to its aircraft, the L-1011 was named “TriStar” following a contest among Lockheed employees. The manufacturer envisioned 1,000 orders for its newest entry in the commercial market, which it had left following production of the model 188 turboprop Electra. 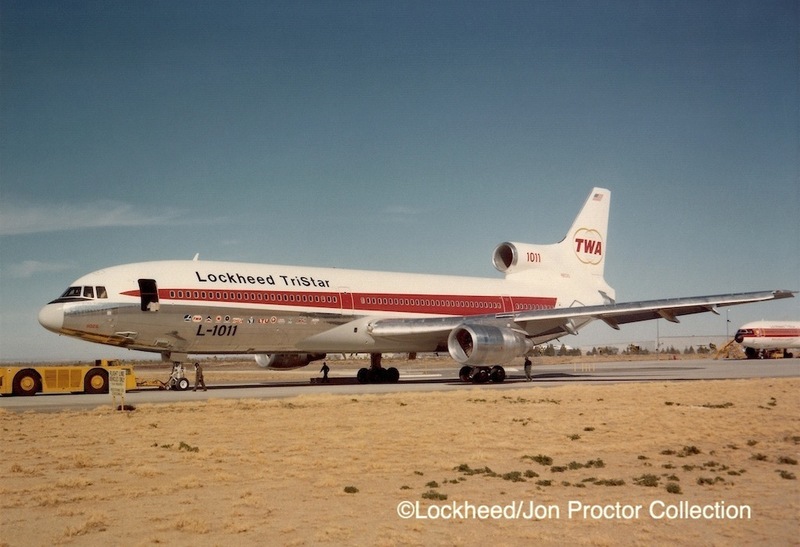 In the end, only 250 L-1011 airframes were produced, marking the last civil airliner from Lockheed. 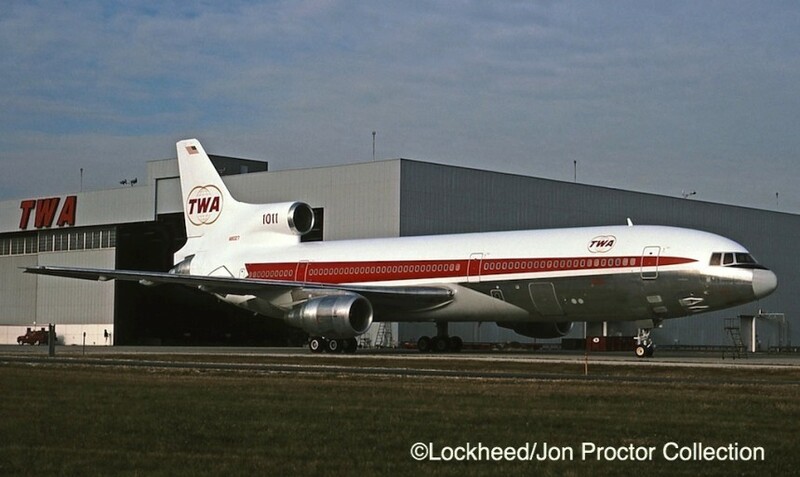 For TWA, the L-1011 order renewed an old relationship with the manufacturer that began in 1931 with the Lockheed Vega and stretched to the propeller-driven Constellation; TWA boasted the largest Connie fleet by a wide margin, operating the type between 1946 and 1967. TWA planners envisioned that the L-1011 would be its flagship on medium- and long-haul domestic flights while the earlier-delivered 747s were to be concentrated on the trans-Atlantic market and some transcontinental nonstops until the new tri-jets were available. 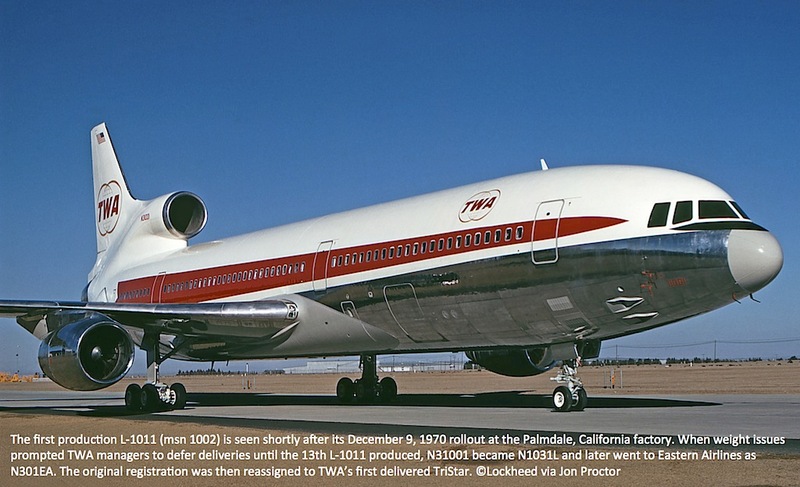 Despite problems with Rolls-Royce, sole supplier of engines for the type, TWA’s first TriStar was handed over on May 9, 1972, nearly on schedule and less than a month after obtaining US government certification. The second airplane was delivered almost two months later. 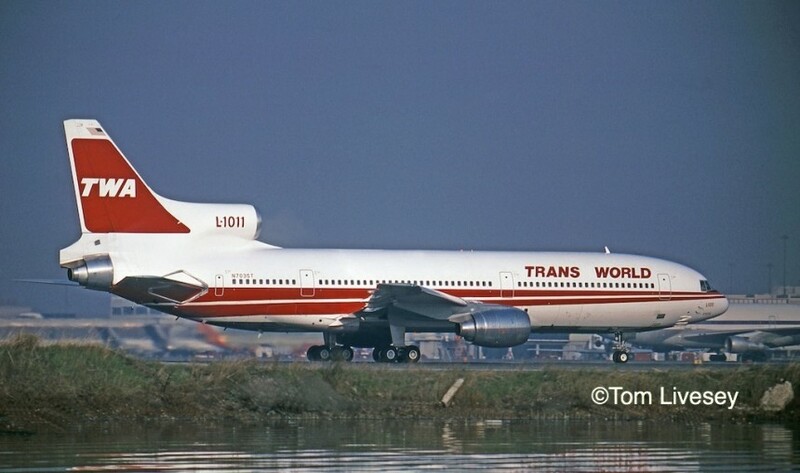 Undaunted, TWA began regular service with its single L-1011 (the airline didn’t use ‘TriStar’ in its advertising) on June 25, from St Louis to Los Angeles. Until arrival of the second tri-jet, N31001 flew a daily Los Angeles–St Louis roundtrip. Chicago–Los Angeles service began on July 8. Nonstops from the Chicago hub to San Francisco began the same month, followed by Las Vegas. Mechanically, the L-1011 was advertised by TWA as “the most advanced airliner in the sky,” capable of flying itself from takeoff to landing. Its Category 111-a, all-weather auto-land system permitted touchdowns with ceiling visibility reduced to zero and 700 feet of forward visibility (later reduced to 250 feet in the United Kingdom), better than DC-10s and 747s of the time. Pilots liked the airplane’s handling characteristics and its ability to take off and land on shorter runways such as those at New York’s La Guardia Airport. 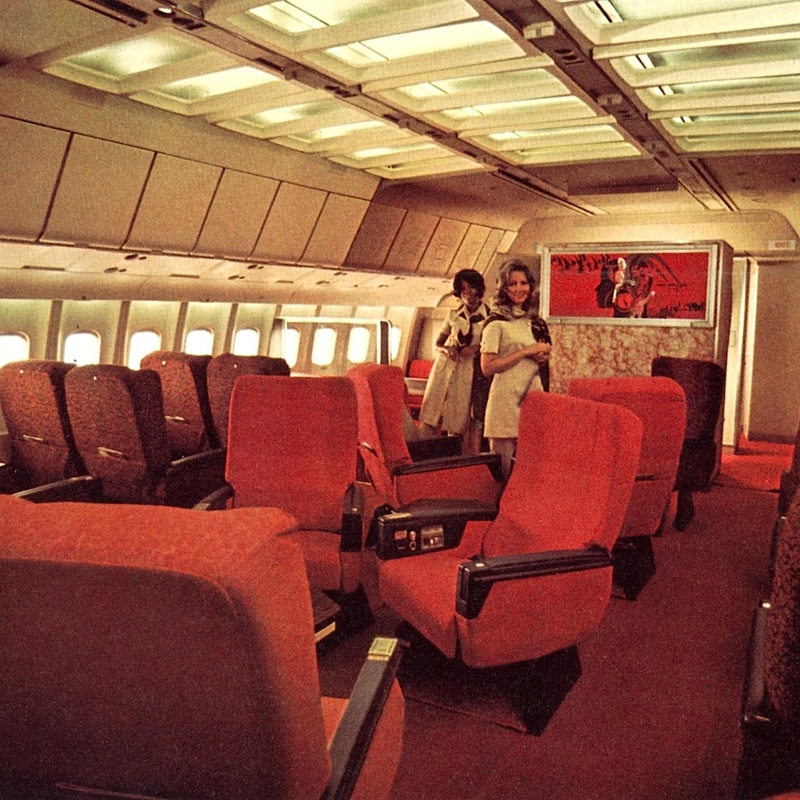 The TriStar was the first type TWA acquired with a factory-installed coach lounge, which seated 10, although two side-facing chairs could not be used for takeoff and landing. Except in overbooking situations, the remaining eight seats were not offered for sale. Waist-high carry-on luggage compartments, located at the R-1 and No. 2 doors, helped to compensate for a lack of centerline overhead bins, a feature Lockheed ignored in favor of a more open cabin design. The second L-1011, N11002, shown departing for Los Angeles on July 11, 1972. Thirty first-class seats and a four-place lounge made up the forward-most portion of the front cabin, designated A zone. Forty coach seats occupied C Zone that ran back to the No. 2 boarding doors; there was no B zone. The coach lounge was placed at the front of D zone, followed by 96 coach seats. E zone, between the No. 3 and 4 doors, contained another 40 coach seats for a total 176. In addition to a pair of first-class lavatories behind the cockpit, five were located just behind the No. 4 doors, nicknamed “cannery row” by crewmembers. 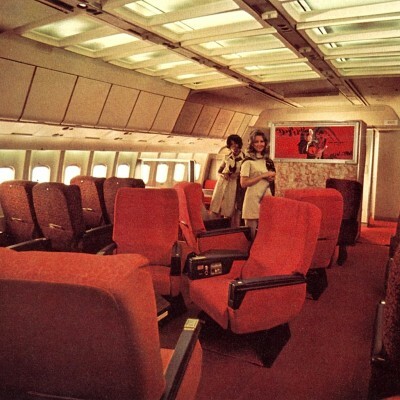 The L-1011’s comfortable seating was immediately popular with TWA passengers. In first class, seats in the center row swiveled to allow groups of four to face each other. Small cocktail tables could be raised up to accept a larger, foldout top for the meal service. 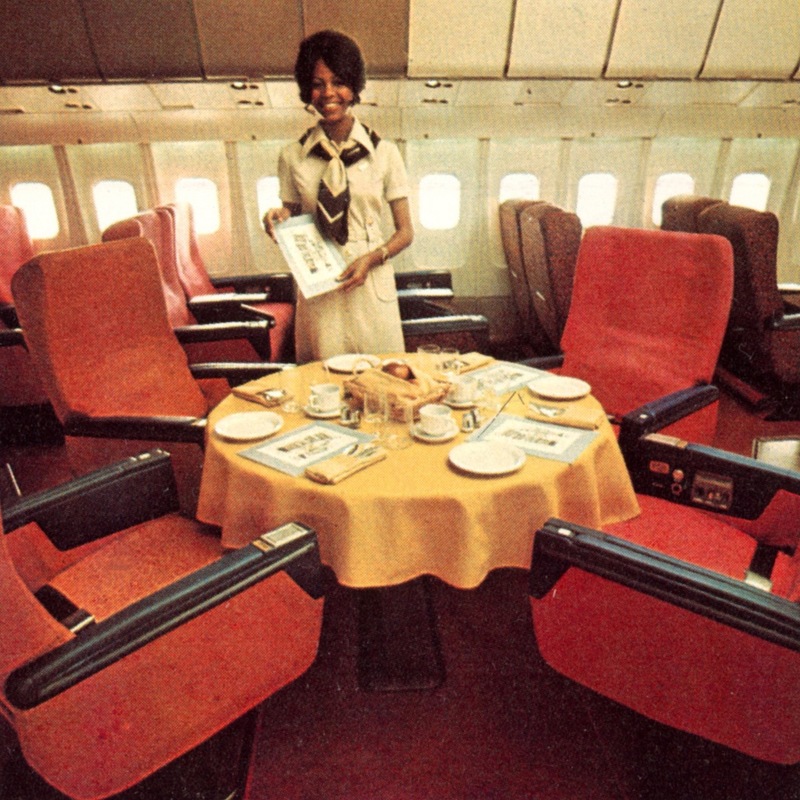 Two of these combinations were possible among the 10 center seats.All the standard-body L-1011s featured an under-floor galley, reached via a pair of lifts that accommodated serving carts or cabin crew. An advantage in Lockheed’s design was a separate access door through which food and beverage equipment was loaded. The first DC-10s had similar galleys but were serviced through the cargo compartment, which required loading ahead of cargo, somewhat restricting the overall process. 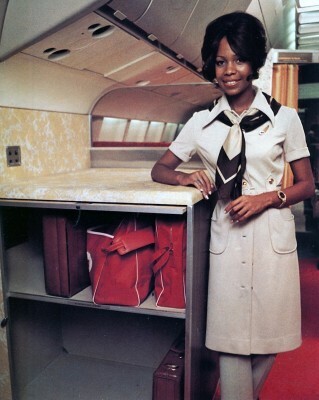 However, the L-1011 galley door was substantially smaller and limited the size of equipment containers. TWA managers implemented a policy of keeping serving carts out of the aisles in coach during the cocktail and meal services. Instead, beverages and meals were brought out individually from ‘satellite’ service centers located between the No. 2 and 3 doors. The idea was to promote the openness of the cabin and facilitate easy movement to and from the aft lavatories. Prior to beginning their service, flight attendants brought beverage carts upstairs to the service centers. Hot meal entrees, restored in galley ovens, were loaded into food carts, then positioned on the main deck. Heated compartments received power from adjacent outlets. As with any new aircraft type, there were teething problems. In the passenger cabin, multiplex systems that controlled passenger reading lights and the audio system frequently malfunctioned, and the heavy first-class tabletops caused the smaller support tables to collapse to the stowed position, usually in the middle of elaborate meal services. But overall the systems performed well. New-type seatbelt and no-smoking signs blinked on and off for a short time when illuminated, alerting passengers. Overall cabin lighting was controlled by switches that could be dimmed gradually. In the coach section, the four center seats were split into pairs by inserting small divider tables to provide a more spacious cabin atmosphere. The first six TWA L-1011s were in service by October 1972, allowing schedule expansion that included a second Los Angeles–Chicago flight and two Chicago–Phoenix sectors with one sequence continuing to Los Angeles. Chicago–Las Vegas and Los Angeles–St Louis flights reverted to 747s for the winter while a Los Angeles–Chicago TriStar service was extended to Philadelphia in December. Eastern Air Lines and TWA began reciprocal leasing of TriStars in 1972 to bolster capacity during the carriers’ opposite peak travel periods. The first TWA L-1011 to join Eastern, N11006, arrived in November and was returned the following spring, when Eastern sent N309EA to TWA for its summer 1973 schedule. Two TWA TriStars, N31001 and N11002, went to Eastern in November 1973, returning in April and May 1974, respectively. In turn, Eastern’s N309EA and N326EA spent that summer with TWA. With one exception (N11006, below), the airplanes remained in their owner’s color schemes. The agreement ended after the 1974-75 winter season, with a single TWA L-1011 (N41020) leased to Eastern. Eastern chose to paint its first cross-lease airplane in full company colors barely two months after it was delivered new to TWA. TWA operated Eastern L-1011 N309EA during for the Summer 1973 season. It is seen at San Francisco on June 3, wearing a “Operated by TWA” sticker. 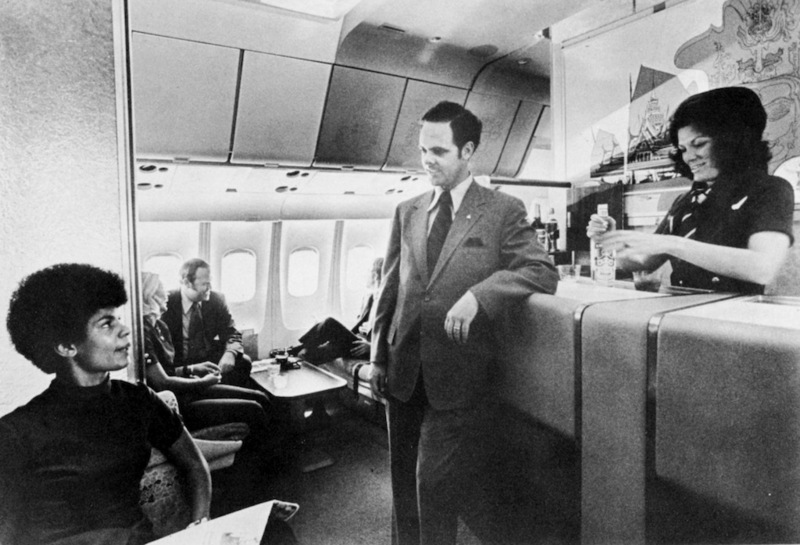 With increased passenger load factors, managers at American, United and TWA successfully convinced Civil Aeronautics Board (CAB) to effectively mandate removal of aircraft coach lounges. Continental Airlines protested but was unable to stop the transition. TWA began tearing them out of L-1011s in March 1973, resulting in an increase of 20 coach seats, to 196; the four-seat first-class lounges remained. 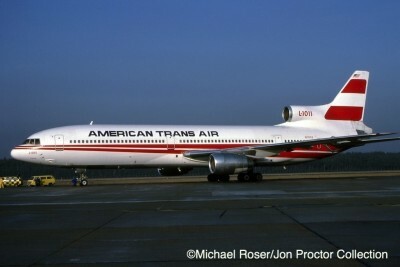 The first TriStar transcontinental nonstop began in April, between Los Angeles and Philadelphia. 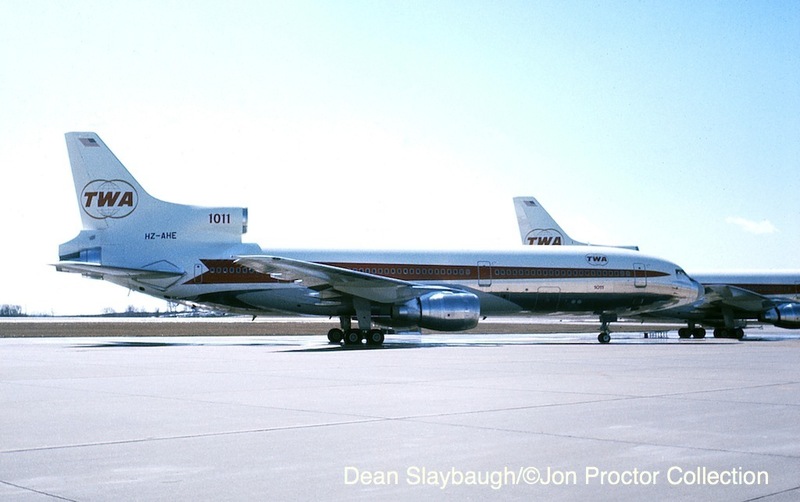 TWA’s L-1011 fleet had increased to 14 by mid-year. July 1 saw the addition of Los Angeles–Kansas City service with Los Angeles–Pittsburgh begun on July 10, bringing the TriStar route map up to 16 city pairs. That fall, Los Angeles–Cincinnati flights were added, along with a ‘round-robin’ Los Angeles–Dayton–Indianapolis–Los Angeles service (Dayton’s runways were not able to handle nonstop widebody flights to the West Coast). 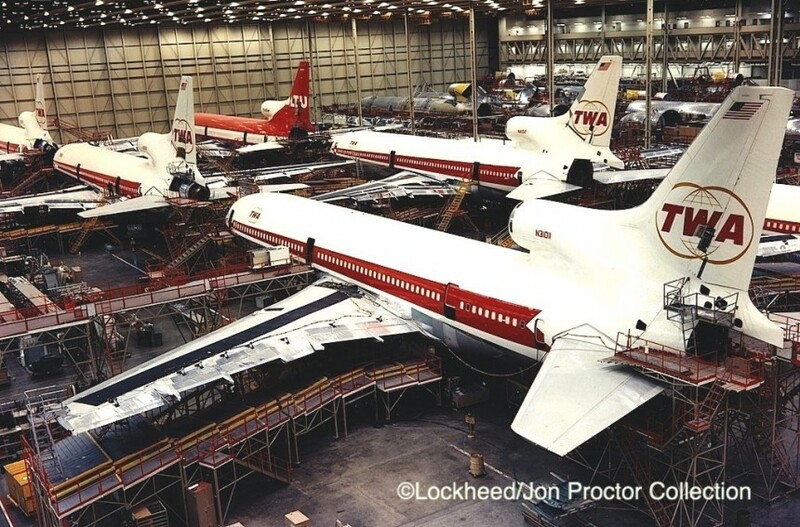 Five of TWA’s second batch of six TriStars dominate the Palmdale plant assembly line in this 1973 photo. In October 1973 members of the Organization of Petroleum Exporting Countries (OPEC) proclaimed an oil embargo against the United States, which lasted until the following March. The resulting shortage of oil products, along with a sharp price increase, hit the airlines especially hard. Nevertheless, TWA accepted 11 TriStars on schedule in 1974 and placed them into service, however four were sold and leased back on long-term contracts. N31007 was damaged beyond economical repair during a ground fire at Boston. Repurchased from the insurance company, the TriStar was cannibalized for parts and cut up. The fleet was reduced by one when N31007 caught fire while parked at Boston on April 19, 1974. The cause was traced to a coffee pot warmer pad, inadvertently left on after arrival, started a trash fire in the aft service center. Despite its relatively young age, the TriStar was too badly damaged for repair and scrapped. Among the new L-1011 summer 1974 roundtrip services were Indianapolis–St Louis–San Francisco, Philadelphia–San Francisco, Boston–Chicago and Washington DC–Los Angeles, plus a second TriStar in the St Louis–Los Angeles and Chicago–Pittsburgh markets and a third flight between Chicago and Los Angeles. With added transcontinental nonstops, in-flight motion picture projectors were installed. By year’s end, the combination of continued hikes in the price of fuel, coupled with an economic recession, put a strain on TWA’s ability to continue its fleet expansion. N81026’s TWA livery was modified with Lockheed titles for a sales tour. The last two of 11 TriStars received that year arrived in December and were placed into storage at the Kansas City overhaul base for more than four months. 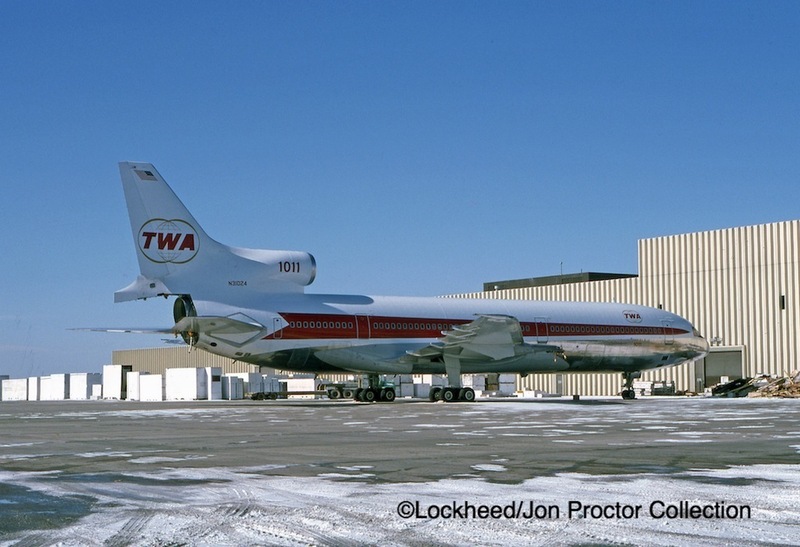 The first to arrive in 1975, N81026, was leased back to Lockheed on a 60-day contract, and used for a sales tour. N31024 was stored engineless at Kansas City following delivery in December 1974. TWA’s cash flow reached a critical stage early in 1975, prompting management to sell nine Boeing 747s to the government of Iran. Deliveries commenced in March and were completed by year’s end. L-1011s took over on the Washington, DC– and Boston–San Francisco nonstop routes along with all but single New York 747 nonstops to Los Angeles and San Francisco. TriStars also operated Indianapolis–Los Angeles roundtrips via Kansas City and both ways between Cincinnati and Los Angeles via St Louis, while five aircraft were stored, some for as long as five months. 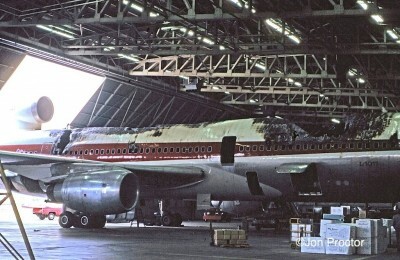 N81027, pictured at TWA’s Chicago-O’Hare maintenance hangar five months after its December 1975 delivery, served as a spare aircraft until traffic picked up. In February 1976, the final two L-1011s were accepted on schedule and immediately sold to Saudi Arabian Airlines. TWA’s management assistance contract, in effect since 1966, smoothed over the transaction. The same TWA factory representatives overseeing TWA TriStar deliveries had accepted earlier-delivered L-1011s for that carrier. 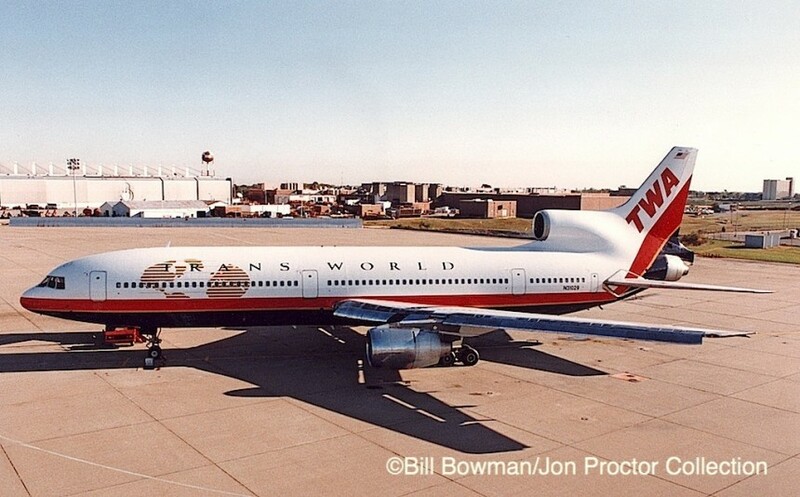 Repainting and conversion to Saudia configurations were completed at TWA’s Kansas City Overhaul base. A rare picture of the two L-1011s sold to Saudia, taken by Dean Slaybaugh at TWA’s Kansas City overhaul base in June 1976. N31032 was re-registered HZ-AHE prior to repainting. Behind it, N30133 became HZ-AHF. The two tail numbers were then applied to later deliveries. TWA adopted a new, double-stripe livery in 1976. 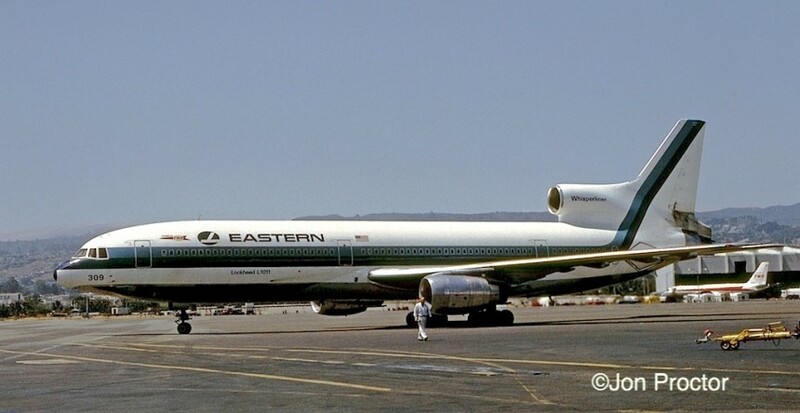 The first TriStar so painted a year later was N11002, seen at San Francisco. Following a study begun two years earlier, a decision was made in early 1978 to begin conversion of six TWA TriStars for trans-Atlantic use. The resulting L-1011-100 featured center fuel tank capacity and increased takeoff weight, from 430,000 pounds to 463,000 pounds. Also included was a new braking system, conversion of door escape slides to slide rafts and a revised seat layout. 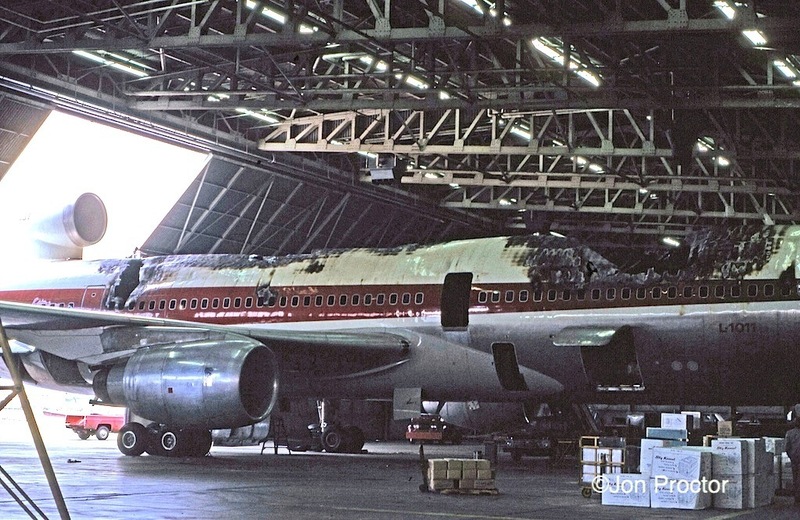 Lockheed undertook basic structural changes with most of the additional work done by TWA, netting a $1.2-million reduction in the overall cost. In-house installation of the triple-redundant inertialnavigation system (INS) alone saved $700,000 in certification expenses. 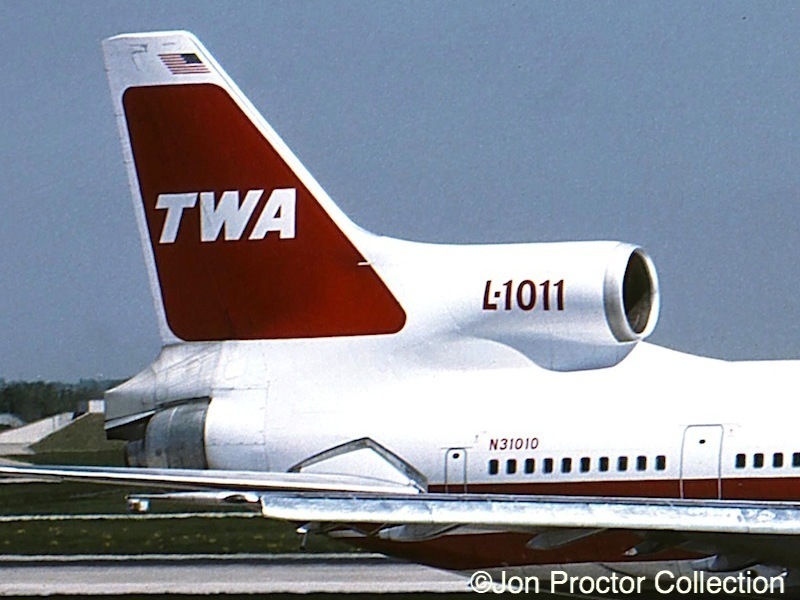 Two TWA L-1011-100s were leased to Delta, including N81028. 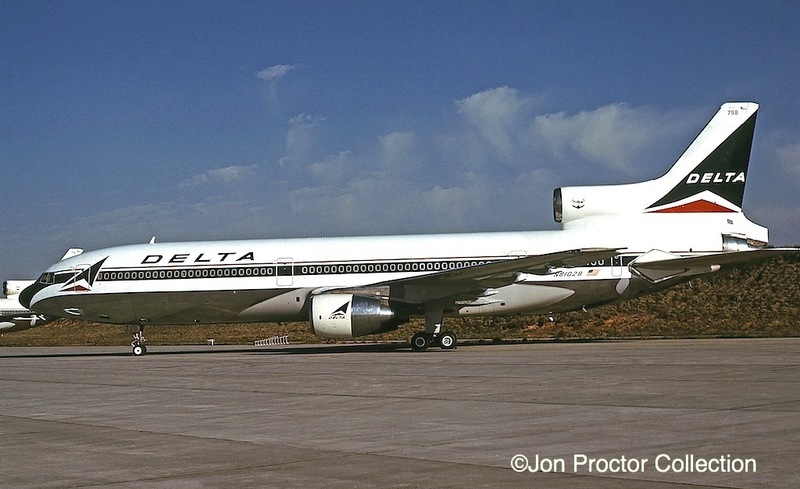 Two TriStars from this batch were leased to Delta Air Lines for its new Atlanta–London flights. Meanwhile, TWA inaugurated “Dash 100” service on April 30, 1978 between New York and London; a second roundtrip began June 8. Boston–Paris TriStar flights were added a year later. TWA’s summer 1978 L-1011 domestic long-haul schedule included four daily nonstops from New York to Los Angeles, three to San Francisco and a single service to Las Vegas. From Los Angeles, TriStars flew to Kansas City, St Louis, Dayton, Philadelphia, Washington DC and Boston. Conversion of the overwater aircraft coincided with the refurbishment of the entire TriStar fleet, including replacing 8-across coach seating with a 9-abreast layout. First class capacity on the -100s was reduced by eliminating the forward lounge, while coach seating increased to 253. On domestic, a 34-first class, 235-coach arrangement was fitted. The fleet-wide changeover was completed by the end of September. 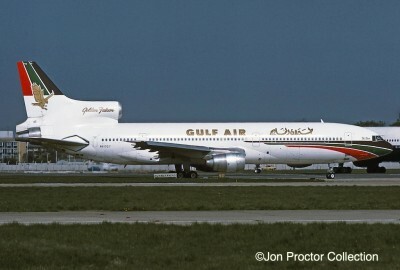 The pictured N81027 and N41020 completed 30-month leases to Gulf Air in 1981. With the gradual shrinking of TWA’s Chicago hub (St Louis would become TWA’s biggest by January 1979), L-1011s were replaced by 707s on routes to Phoenix, Los Angeles and San Francisco, limiting O’Hare TriStar schedules to a pair of Las Vegas roundtrips and single services to Philadelphia, New York and Boston. TWA launched a major Florida schedule expansion at the end of 1979, adding Ft Lauderdale, West Palm Beach, Fort Myers and Orlando to existing Tampa and Miami service. Initially a pair of TriStar flights were scheduled between New York-JFK and Miami, followed by Ft Lauderdale–New York-JFK and Miami–St Louis. The two L-1011-100s leased to Delta rejoined TWA in May 1980. The summer schedule featured all-widebody flights across the Atlantic. Twenty-eight weekly Tri-Star segments included New York–Lisbon and Washington, DC–Paris. Boeing 707s were scheduled to operate intra-European flights, allowing the 747s and L-1011s to turn around at gateway cities and return to the United States. In addition, several trans-Atlantic segments were discontinued but the overall upgrade to widebody jets resulted in greater capacity than a year earlier. The same airplane with a Frisbee fairing. In late 1979, TWA began installing interior noise-reducing Frisbee fairings on its L-1011s. Airflow diverters running from the fuselage top to the center engine intake also reduced vibration in the TriStar’s aft cabin. The device, named after Lockheed engineer Lloyd Frisbee, was factory-installed on L-1011s beginning in 1980 and applied to all L-1011-500s. TWA was the only carrier to retrofit its fleet. “Ambassador Class,” TWA’s business-class product, was introduced on trans-Atlantic widebody flight beginning in April 1980. The otherwise identical forward coach cabin was designated for the service, where passengers received upgraded meals along with free liquor and audio headsets. Beginning in September, the use of a “slim-line” design allowed the addition of nine coach seats on domestic TriStars, boosting capacity to 34 in first-class and 244 in coach. L-1011-100s remained at 30 first and 253 coach. 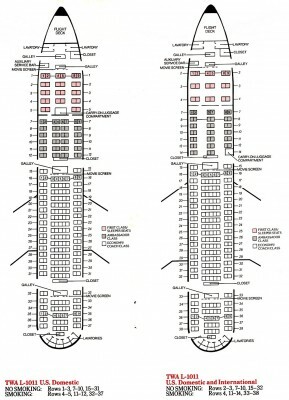 A year later, 10-across Ambassador Class seating on 747s was replaced with wider seats in a 2-2-2 arrangement. 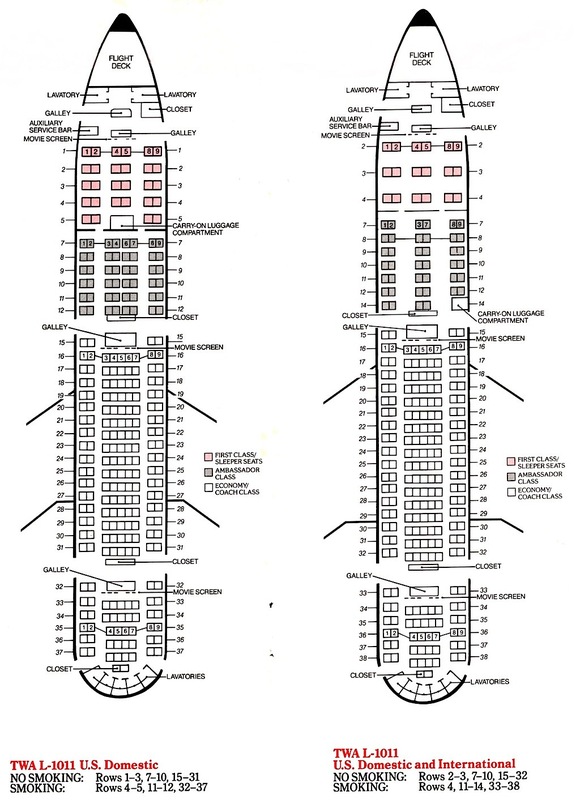 On TriStars, 9-abreast was reduced to 8-across, not unlike the original 1972 coach layouts. Forty-eight seats made up the Ambassador section directly behind first class. 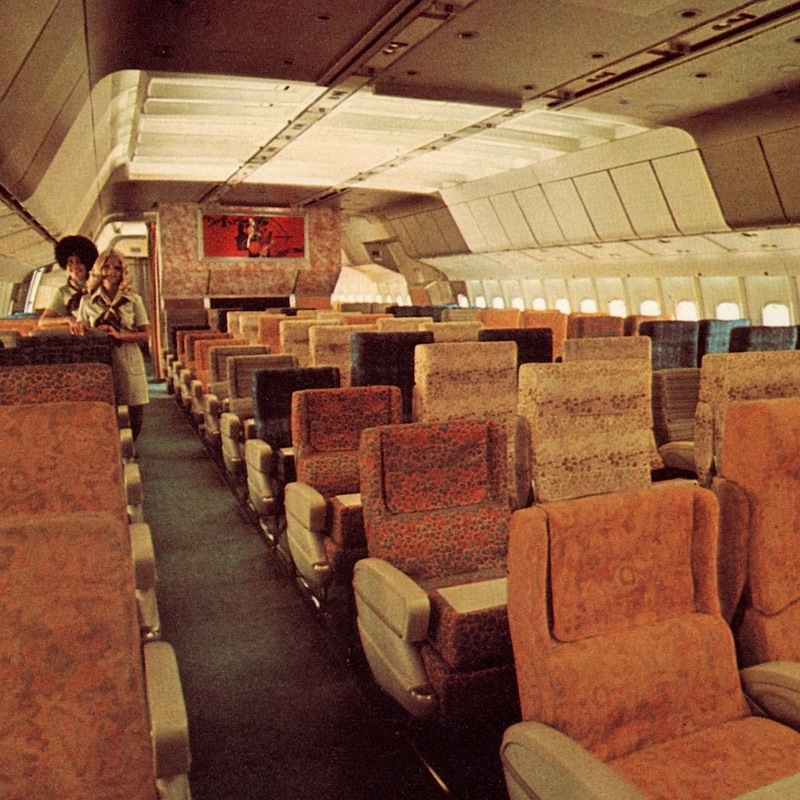 To match the quality of 747 seating, the same 6-across seats were later installed on all L-1011-50s and -100s, reducing Ambassador capacity to 40. At the same time, first class was sharply curtailed, from 30 to 18 with the installation of sleeper-style seats and increased legroom. Coach capacity was cut to 203. The fleet-wide changeover took more than a year to complete. Five more TWA L-1011s were converted for overseas use in time for the 1981 summer season, including two returning from 30-month leases to Gulf Air. Designated internally as the L-1011-50 (for its 450,000lb maximum takeoff weight), the variant was nearly identical to a -100 minus the extra fuel capacity. It could routinely complete shorter trans-Atlantic segments from New York or Boston to destinations such as London and Lisbon. Although freight capacity was often restricted on longer flights, an L-1011-50 carried a record trans-Atlantic cargo load of 16,714 pounds between Lisbon and New York on June 27. 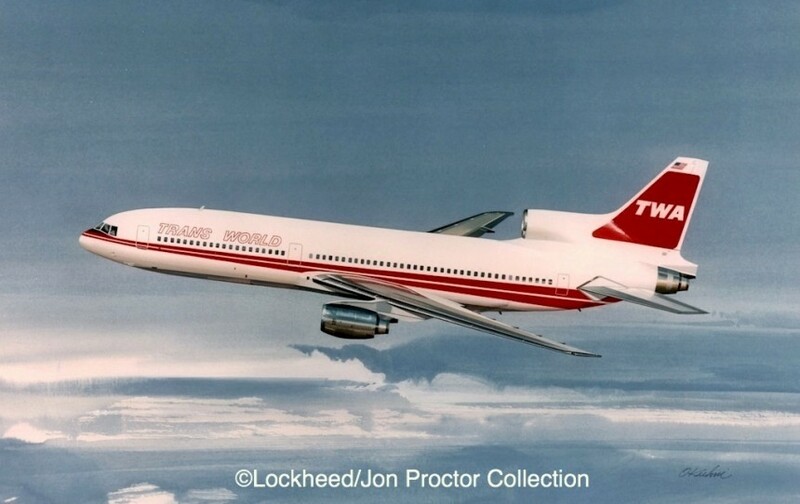 Having exercised attractively priced options, TWA accepted five new-build L-1011-100s from Lockheed. Two were handed over at the end of 1981 and three arrived in time for the 1982 summer schedule, 10 years after the initial TriStar deliveries. These last fleet additions occurred even as Lockheed announced it would take no further orders and planned to terminate L-1011 production by mid-1983. N7035T, one of five new-build L-1011-100s for TWA, ready for departure on Runway 1-Right at San Franicsco International, December 11, 1982. By then the TRANS WORLD titles had been filled in for better visibility. The final five aircraft to come off the assembly line, L-1011-500s, were without buyers and stored at the Palmdale plant. During an internal employee presentation, TWA President Ed Meyer told how Lockheed’s chairman Dan Haughton had called him to propose the airplanes for TWA at bargain rates. “Make me an offer,” he pleaded. Faced with heavy financial losses at the airline, Meyer was unable to do so. 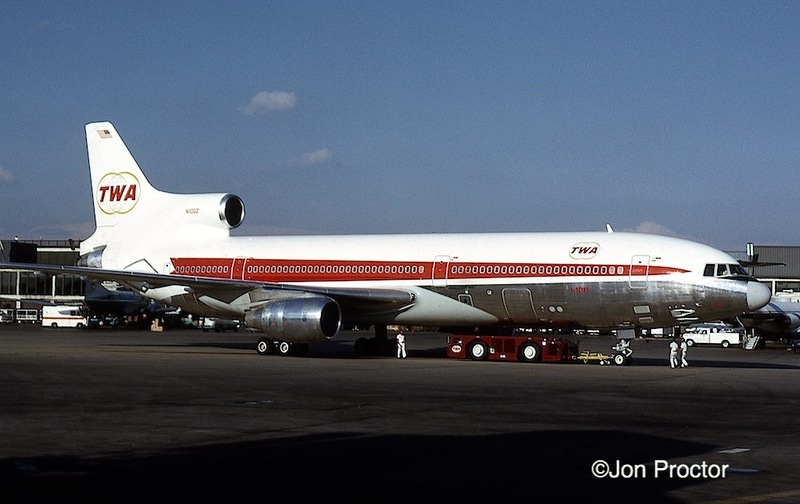 Tristar 500s would have better fit into TWA’s fleet than the three 747SPs delivered in 1980, especially for use on long, thin overseas routes but the timing was not there. Lockheed later sold four of the airplanes to ALIA Royal Jordanian Airlines and one to the Algerian government. Lockheed pitched five ‘white tail’ L-1011-500s to TWA at the end of TriStar production. With the addition of New York–Seattle nonstop service in May 1983, several short segments could be ridden on a TWA TriStar, from long-standing Boston–New York to Phoenix–Tucson, begun in October. Los Angeles–San Diego service was instituted a year later. At one point, a TriStar scheduled from JFK to St Louis stopped at Newark, westbound only. Despite these short flights, daily utilization averaged 9 hours, 43 minutes by year’s end. Three more TriStars were upgraded to -50 standards in spring 1984, building the overseas-capable fleet to 19. Although a portion of flying time remained on domestic schedules, overall international capacity that summer was increased by 21% above the previous year. Trans-Atlantic TriStar activity comprised daily Boston–Paris flights as well as new Amsterdam and Brussels service from New York. L-1011s also operated from New York to London, Paris, and Lisbon plus Philadelphia–London and Washington, DC–Paris. Intra-European flying included Paris and Rome to Tel Aviv. The sale of one (of three) 747SPs resulted in the reassignment of a TriStar from domestic to trans-Atlantic duty until a second-hand 747-200B arrived, from TAP Air Portugal. In October 1984, TWA’s first two L-1011s were sold to Interface Group, Inc., which formed Five Star Airlines to operate charters for its tour subsidiary during the winter months. TWA then leased the pair back each summer. 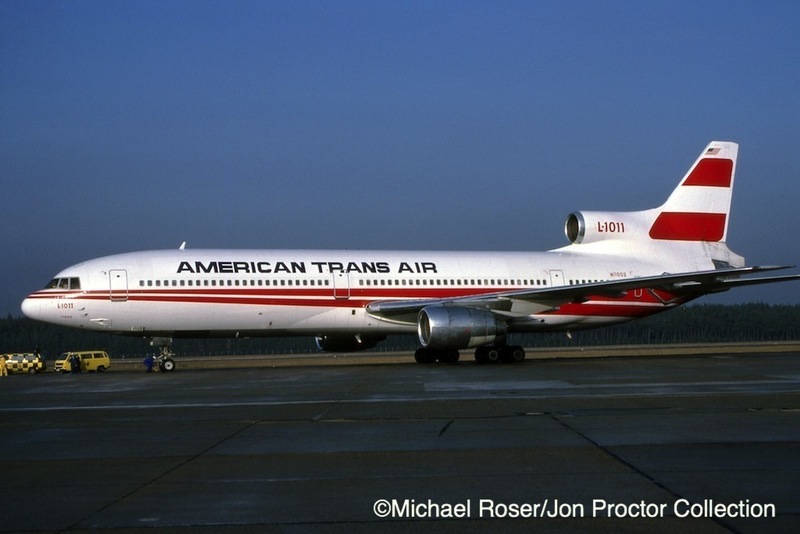 Five years later the aircraft were turned over to American Trans Air, which continued to operate the GWV winter charter schedule. The second TriStar, N11002, was destroyed during an aborted takeoff accident at New York-JFK on July 30, 1992 while being operated by TWA. The completely full airplane was successfully evacuated before fire consumed most of the fuselage. One of the two TWA L-1011s to wear Five Star markings is seen at Los Angles in November 1984. The simple livery modification allowed easy changeovers between the two operators. 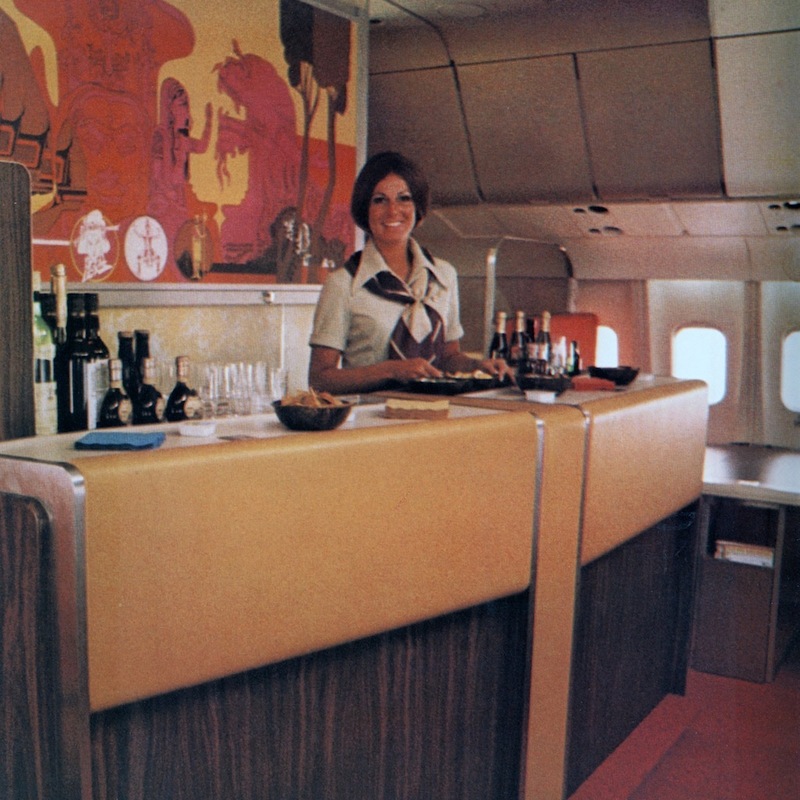 The use of new “Singl-Serve” meal carts, earlier put into service on TWA 747s, was expanded to the L-1011s in 1985. With self-contained heating units, the carts eliminated the need for conventional food ovens. At the same time, five additional coach seats replaced the galley service centers adjacent to the No. 3 doors, bringing domestic TriStar coach capacity to 199 and 209 on overseas versions. N11002 while being operated for Interface Group by American Trans-Air, photographed in January 1990 at Nuremberg. Summer 1985 European schedules increased 18% with 207 weekly trans-Atlantic roundtrips. Some of the capacity was undertaken with Boeing 767s that had been cleared for extended overwater operations earlier in the year. L-1011s were utilized for new flights between Cairo, Kuwait and Bombay and Paris to Geneva. Daily Los Angeles–Honolulu TriStar service began in October and a month later the airline expanded service in the Caribbean market from November, redirecting some trans-Atlantic L-1011s flying onto routes to San Juan from New York and St Louis, plus New York–Nassau–Freeport, Bahamas. Carl Ichan became an active buyer of TWA stock and took control of the company in fall 1985, followed by the acquisition of Ozark a year later, resulting in a continued buildup of St Louis service. The August 1986 timetable included 23 daily L-1011 departures from the hub city to 14 destinations. Following increased terrorism in the Middle East earlier in the year, TWA sharply reduced overseas flying that resulted in TriStars and 767s taking over some destinations from 747s. New York–Brussels and Baltimore–London Gatwick TriStar flights were among new services highlighting the summer 1987 trans-Atlantic schedule, followed a year later by New York–Oslo–Stockholm. At year’s end, the No. 3 position Rolls-Royce RB211 engine on an L-1011 completed 20,000 hours of uninterrupted airline operation, setting a record for jet engine reliability from service entry. Since the TriStar was delivered to TWA on April 9, 1982, the power plant received only routine on-wing maintenance during more than 5,300 flights. A throwback to the old interchange service concept was resurrected when TWA and Gulf Air entered into a blocked-seat, code-sharing agreement calling for TriStar flights from New York to the Persian Gulf States via London utilizing Gulf Air L-1011s. From June 1988, TWA crews operated a daylight service from New York to London where Gulf Air staff continued the flights to the Middle East. 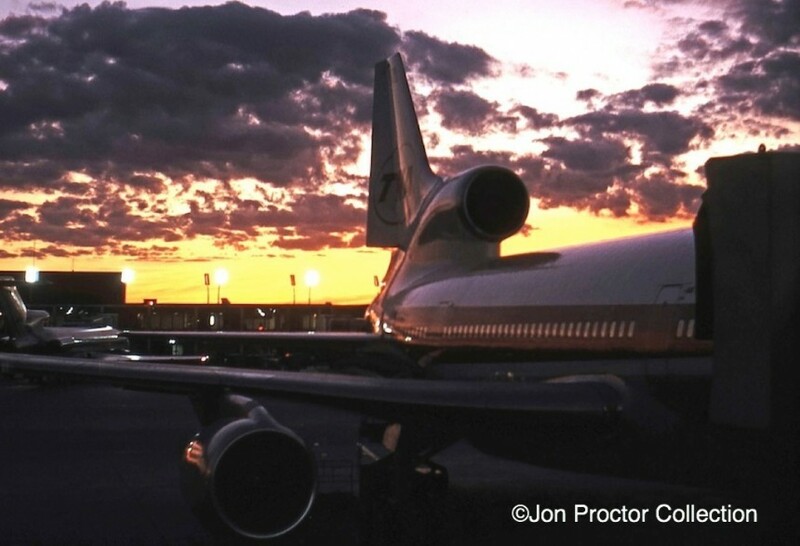 Return trips brought the TriStar back to New York in the late evening. An order for 20 Airbus A330s was announced in 1989. The contract, which included 20 options, called for deliveries beginning in late 1994 or early 1995 and allowed conversions of up to eight options to A340 orders. It marked the airline’s earliest plan to begin drawing down the TriStar and 747 fleets, one that never came to fruition. 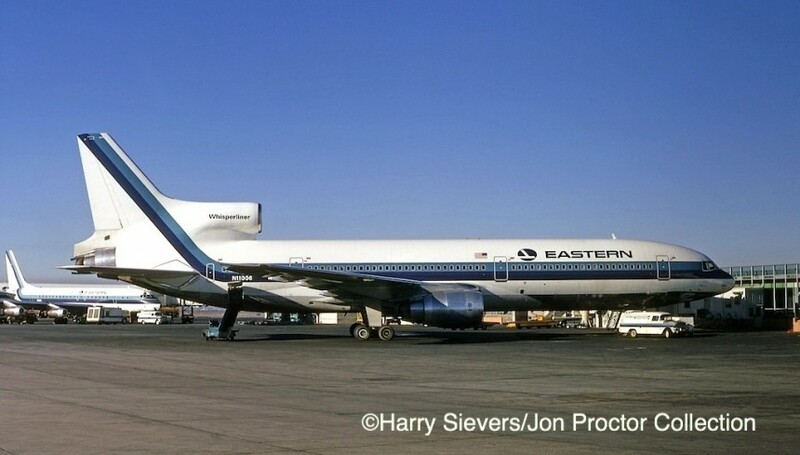 That same year a TriStar flying to Honolulu from Los Angeles experienced an en route fuel leak after having passed the point of no return to California. An emergency night landing was made at Hilo with barely 4 minutes of remaining flying time remaining, not even enough for a missed approach. L-1011-100 N81028 was photographed at Paris-de Gaulle Airport in June 1985. On February 2, 1990, TWA announced the planned sale of its Chicago–London route to American Airlines. By then it had reduced service to once-weekly TriStar nonstop in order to maintain route authority until the sale. It was the airline’s longest nonstop L-1011 schedule. The remaining London-Heathrow rights were sold off a year later with service to Gatwick Airport carried out by 767s, but TriStars continued across the Atlantic that summer from Boston and New York to other destinations. Financial strain caused by continued fuel price increases prompted the reconfiguration of TWA’s aircraft wherever possible. Overseas L-1011 coach capacity was stretched to 218 by early 1990, while domestic versions were unchanged. In 1993 the airline introduced “Comfort Class” in coach, attempting to boost lagging passengers loads. Thirteen coach seats were removed from domestic TriStars while 18 came out of the L-1011-50s and -100s, creating a 34- to 36-inch seat pitch, claimed to be the most generous in the industry. Six Ambassador Class seats were pulled from the overseas TriStars as well. Due to insufficient offsetting revenue, the program was gradually dismantled after 16 months, and the earlier L-1011 capacity reappeared. The acquisition of four leased 767-300ER aircraft allowed removal of all L-1011s from trans-Atlantic service effective June 1, 1994. TWA announced the removal of first-class sections from its widebody fleet in September. Ambassador Class effectively moved to the former first-class sections and was renamed “Trans World One” in March 1995, with the former space replaced by more coach seats. Because this new policy was only for overseas and transcontinental flights the L-1011s were not reconfigured and instead saw added duty in the Caribbean and Florida markets. 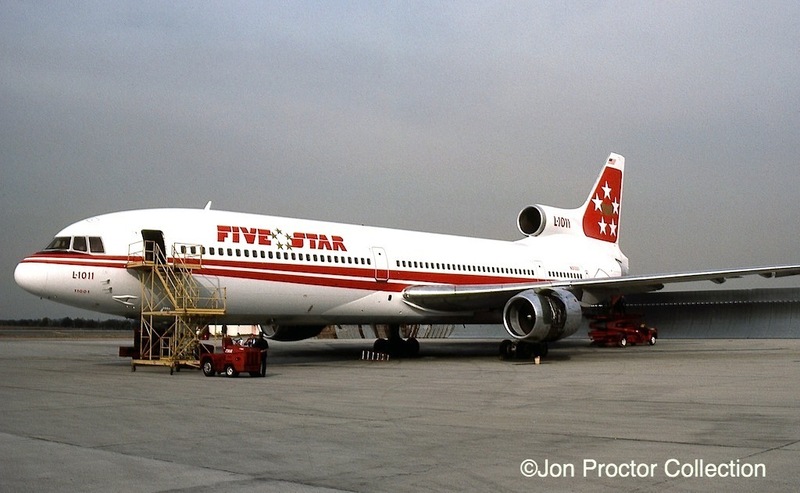 Despite a May announcement that all TriStars would be retired by year’s end, the type continued in service, although two coming off lease were returned to the owners that fall. 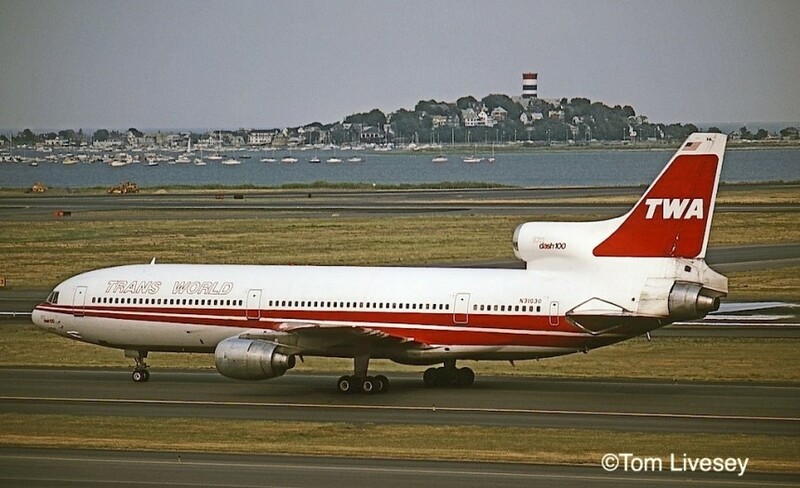 N31029 was the only L-1011 to wear TWA’s final livery. It is seen at the airline’s Kansas City overhaul base in November 1995, shortly after rollout from the paint hangar. It was announced in February 1996 that TWA would acquire 20 Boeing 757s, with three scheduled for delivery that year, followed by 12 in 1997, two in 1998 and three in 1999. 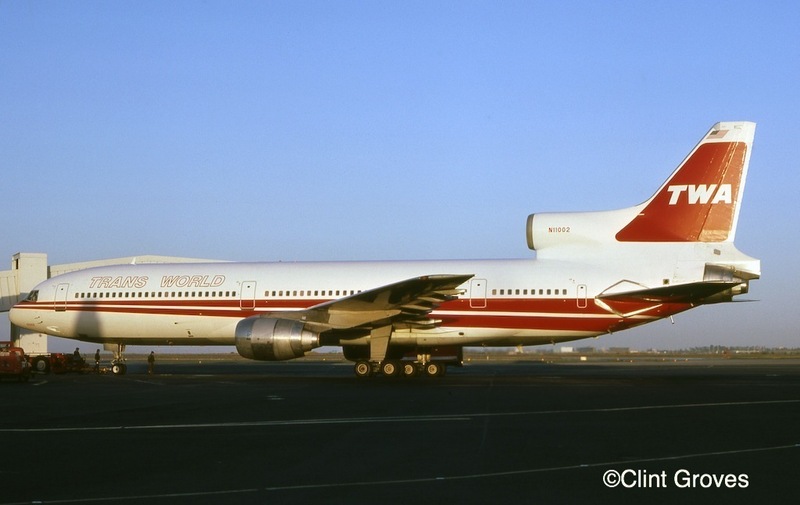 The new Boeing twins were to gradually replace TWA’s last fourteen L-1011s still in service. Three of the 12 remaining TriStars were retired with implementation of the January 13, 1997 schedule change along with eight (of 14) 747s. Gradual withdrawal of TriStar service culminated on the final day of L-1011 revenue flying, September 3, 1997. TWA operated three flights, from Boston and Orlando to St Louis and a Los Angeles–New York-JFK nonstop, which was the last to land. Despite two L-1011 hull losses, there were no fatalities or serious injuries to passengers or crewmembers. The fleet more than earned its keep. 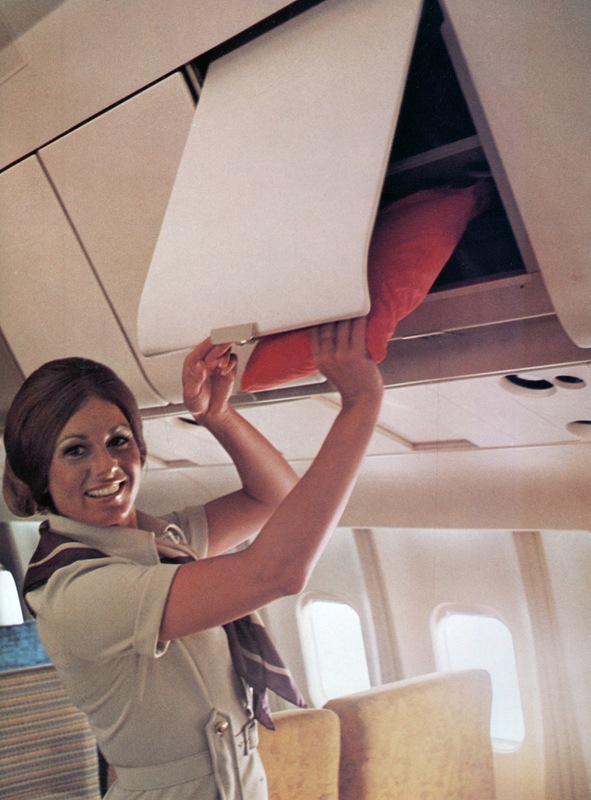 In addition to passenger revenue, domestic cargo loads in excess of 25,000 pounds were possible, thanks to the type’s spacious belly compartments that accommodated 747-compatible LD-3 containers. In addition to extensive use on overseas routes, Lockheed L-1011 TriStars provided dependable service and carried the lion’s share of domestic capacity on TWA’s routes for a quarter century. 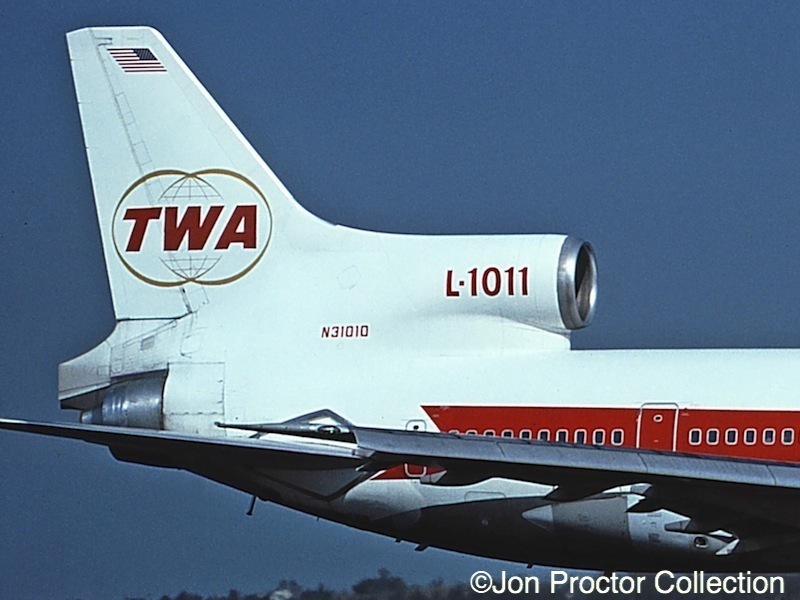 Click here to view/download a TWA L-1011 fleet list in PDF format. As a TWA Director of Customer Service (DCS), I was fortunate to be on the L-1011 inaugural flight, June 25, 1972, from St Louis to Los Angeles, serving as an instructor. That’s me in the dark suit with garish yellow and maroon tie. More on my TriStar experiences can be found here. What memories for me. From ORD DCS to SEAKT I loved that airplane. During the Hadj in 2004 I had the pleasure of flying ex TWA N31033, L-1011-385-1-15 TriStar 100 (193B-1221), JED-NIM-JED; then in service with StarAir (Jordan) with an AOC from Sierra Leone, 9L-LDN. It was configured with 360 seats and lower galley. …Still a smooth flying machine after 3RD world abuse. Spent time on both sides of the cockpit door on the L-1011. First as a JFK based DCS and later as a co-pilot. After 18 years with TWA, 9 1/2 furloughed(two tours as DCS built in there)and the rest as as 727/707/1011/747 flight engineer, I actually became a pilot again!! 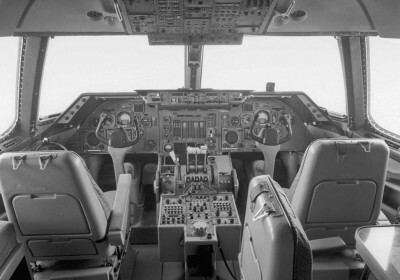 Bid the L-1011 co-pilot seat because I had the seniority and checked out on TWA’s most sophisticated aircraft. It is said that once you ride a bike that you never forget how to do it BUT that training was actually re-training for me. Hard, hard work that training was but the 1011 was a jewel in every way (well, honestly, heavy on the ailerons compared to the 747). Landing in SEA with full Cat III auto-land and using the taxiway center guide lights to get to the gate. Didn’t see spit till the guy with the wands appeared. First landing at LGA, at night, left descending turn to line up with the runway and found myself VERY low! After landing, one of the F/A’s said that she had never looked INTO the nearby apartment windows before! From FRA to JFK with a -50, shutdown #2 engine due to high vibrations. J.C. Cameron was the Captain and he always flew eastbound and the F/O west. We elected to fly on two to CDG rather than return to FRA (pax and repairs considerations) and as we got close to CDG, I asked J.C. when he wanted the plane. His response was “I fly east, you fly west.” We had flown quite a bit together so he trusted me to make a two-engine max landing weight landing at CDG. Wow! Was I psyched! Landing was good and I practically floated in my seat to the gate. The engine was toast and we spent an extra day in Paris and deadheaded home the next day. And, yes, I bought the drinks that night! Jon, thanks for the memories and letting me share a few about the great 1011. 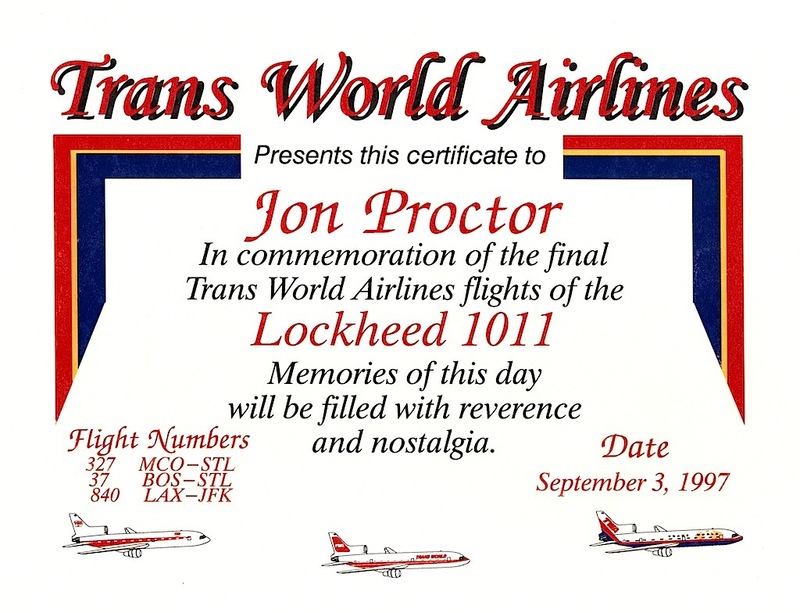 Kudos, Jon, on another outstanding piece of history … all the better, I’m sure, because of your personal involvement with TWA’s L-1011s. Long before I knew you, I remember seeing your picture in the TriStar book written by Doug Ingells shortly after the type entered service. Although I was not personally associated with the aircraft, I was an L-1011 fan from beginning to end. I’ll never forget the first time I saw a TWA L-1011 taking off from Chicago-O’Hare. And I’m still saddened that the RAF has retired its TriStars. But in between those events, I enjoyed many a pleasant and comfortable flight aboard TWA L-1011s, as well as a few of Delta’s aircraft, too. 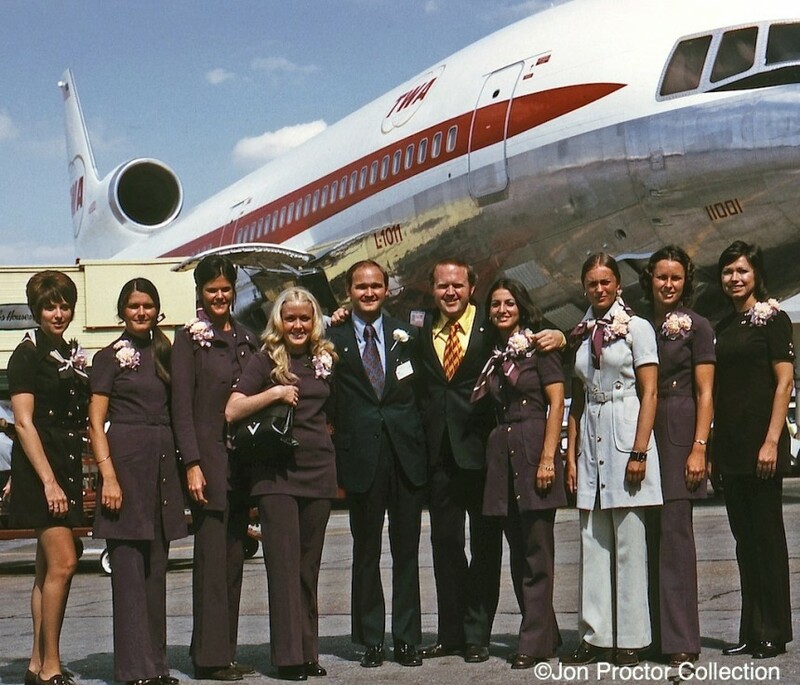 Many thanks for telling the story of TWA’s TriStars. As always, you did a superb job! Great article, Jon. I was with you on the inaugural flight. I was sitting in the jumpseat getting initial operating experience as a pilot. Great airplane and great memories. It was a nice reception party in LAX. Thanks for another outstanding production, Jon. I could never decide whether the L10 or 76 was my favorite airplane. I love them both. I don’t remember the cross leases with Eastern. Probably before I was on the L10. Enjoyed the article as it brought back memories of my first airplane ride (TWA from Philadelphia to St. Louis) on an L-1011. Beautiful airplane. Jon- Thanks so much for sharing another excellent history/pictorial. I only flew on a TWA L10 one time – aboard N11004 on a CVG-STL-LAX trip in August, 1978, but I remember it well! Great article…great airplane. I was fortunate to be selected to fly the flight from LAX to JFK…the last landing. Does anyone who flew on this service remember the flight? From Jon: The April 3, 1978 TWA Skyliner states that there were actually three celebrity chefs aboard: Paul Bocuse, proprietor of the three-star restaurant which bears his name near Lyons, France; Roger Verge, owner of the similarly honored Moulin de Mougins in Mougins on the French Rivera; and Gaston LeNotre, generally recognized as his country’s premier dessert and pastry chef. Great report for a great aircraft, state-of-the-art airplane in her time. Once again, you have presented the TWA crews with an excellent history. just out of a C check. It should ferry to MCI In January. The MD83 is the TWA Wings of Pride machine. It is in the hangar being painted. The TWA overhaul base is the present base of operations. Both machines will be flown with TWA livery. these bird around in record time. Kudos to Jon on a great job as always. Never in a million years did I imagine that I would log almost 3400 hours sitting at the engineer’s panel for TWA between the spring of 1989 and early 1994. Might have been the best five years of my life, flying all over Europe, Tel Aviv, Cairo, back and forth to San Juan…with some of the finest, and most memorable, characters in the aviation business, on both sides of the cockpit door…several of whose names appear above in previous comments! Hi Jon, What a great article about the l1011, the pics are great too. Only you can produce something like this. I treasure your web site .it is the bible of our history..thanks for keeping TWA alive remembering my 16 fantastic years at TWA ATO and Cargo CDG . Have a great and healthy 2015 !! If only the last three flights had been numbered TW10, TW11, and TW1011! 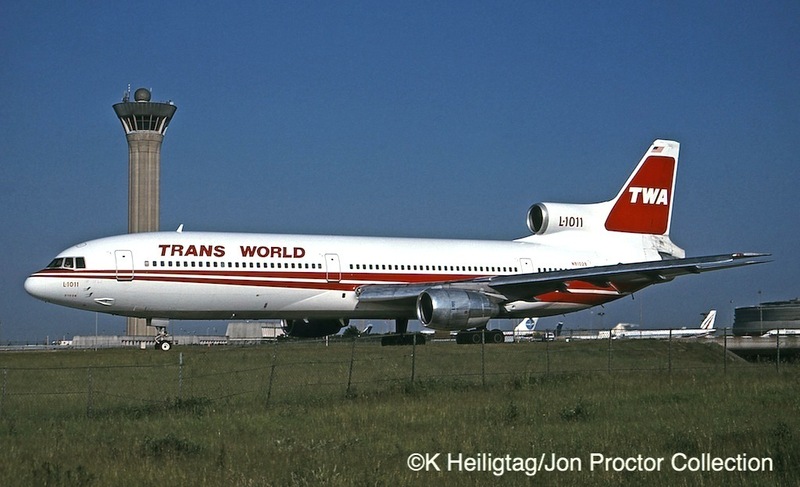 Thanks for a great history of TWA’s operation of the TriStar. Your photos and personal anecdotes are also much appreciated. I was fortunate to be the first co-pilot to get a type rating on the L1011 — was the schedule chairman for SFO when TWA announced they were going to use it for international, and I “volunteered”.. Still remember my rating ride out of MCI with Ted Coakley on 20Dec1977! I may have said it before, but if so, I’ll say it again – how much I enjoy your site and the airline memories you share with your readers. I must admit, I feel very nostalgic for the years I worked with AA in the late ’80s and early ’90s. I count myself fortunate that I experienced working in the industry while there was still some glamour to it – an age when male business pax still wore suits and ties and a roast beef was carved on the cart in the DC-10 F-class cabin! Another thing I look back at in fondness was the degree of respect and trust that our positions received – and demanded. Passengers back then – for the most part – were still excited to travel by air. How the industry has changed! Thank you so much for sharing your great adventures along the way with us Jon. With your articulate details, words and photographs you provide such a gift to those like myself who came on board a little later – in the post deregulation “hub” era. I’ve had the pleasure of meeting you during your Flight Attendant days while working as a Customer Service Agent for TW at PDX (’83/’84), prior to my leaving to embark on my own career as a Flight Attendant for American Airlines in 84. I remember you as a nice, easy going guy and always a pleasure to talk with. At the time I had no idea of your vast portfolio. Thanks for chronicling it. Wonderful story Jon! Thanks for capturing these memories for the rest of us to enjoy. My father, John Saunders, was the first officer on your final Flight #327 from MCO to STL on Sept. 3rd, 1997. He vividly remembers leaving STL for one final leg. After you guys disembarked at STL he and the captain flew the empty L1011 to Kingman and parked it in the boneyard. He often recounts the story because it marked the end of his career at TWA. He was 59 at the time – one year shy of mandatory retirement. Thank you for sharing your many memories working at TWA! It’s great to preserve these memories with all the changes that have taken place in the last two decades. My first time flying was with TWA when I was five years old. That was in June 1993. We flew from Philly to St. Louis and back. I have been trying to figure out which aircraft would have been used for those flights, since my memory of the trip at that age was not exactly photographic. I do know the return trip (STL-PHL) was flight 108, since they gave me a “Flight Plan” with the names of the flight crew, the departure time, and the weather. There was a flight engineer, so that reduces the amount of aircraft types it could have been. Do you have any information on what would have been flying those routes or where I could find that out? I’d greatly appreciate any information you could provide. Great Pictures-I have memories of the 1011’s parked at the KC overhaul base, and flew on them on the MCI-LAX route in the early 80’s and to Europe in later years. The crafts were spacious and designed for comfort, unlike the single class high capacity layouts you see today on many domestic routes. As always, your pieces are well written & full of facts that I didn’t know. I came to your site after reading the Museum Blog about the 1011. I flew it for about 7 or 8 years as a SFO FO & later a Captain out of JFK, LAX/SFO, again JFK after Carl closed the West Coast. There are a number of things about the 1011, and the 1011 vs. the DC-10 that I haven’t seen mentioned. Please don’t hesitate to edit anything I say if you don’t think it is appropriate. I can’t tell you how many times I heard Flight Attendants complain about the climb to get from the rear of the plane to F/C or the cockpit. The plane flew with about a 2 degree tail down attitude. Whether the engineers just stuck the wings on at the wrong angle, or miscalculated the weight or it was meant to be, no one seemed to know, but it must have been tough climbing that hill 100 times at 7500 ft. cabin altitude. Despite the 2 degree pitch ‘situation’, the thing that the majority of pilots appreciated the most about the L-10 over the DC-10 was the engineering. The story was that Douglas spent one year less designing their plane. In my opinion, that showed in relative safety. I can only remember one “hull loss” that might have been caused by a design “deficiency”, and luckily that happened to another carrier. On the other hand, there were a number of hull losses on other carriers that were caused by a failure that, if they had happened on the 1011, would have been, “a great story to tell my grandkids”. Everything above is personal opinion – and who ever knew an opinionated pilot? Many thanks for your kind words; much appreciated. by the galley so I was galley gal until they learned how much fun it was to be down there. I have to admit on some red eyes late at night the groaning and creaking down there was a bit spooky. The elevators would sometimes ascend or descend without anyone calling them. I’ve only learned in the intervening years just HOW advanced that plane was – notwithstanding my uncle’s years at Convair when they KNEW those POS cargo doors were gonna fail on the DC-10. If I were ‘rich’ now, I’d want a personalized 727… If I were REALLY RICH, I’d want my own L-1011 – and land it anywhere on earth in any kind of weather! I’d buy a TriStar too, Marko; thanks for your comments. What an amazing and detail history…thank you so much! at Five Star Airlines (Boston) I dated one of the flight attendants. configured those charters for 345 pax. all to Mexico and the Caribbean.